On Monday Oct 19, I presented a proposal for steelhead monitoring to the Tri-county Fish Team and Department of Fish and Game (DFG) representatives. 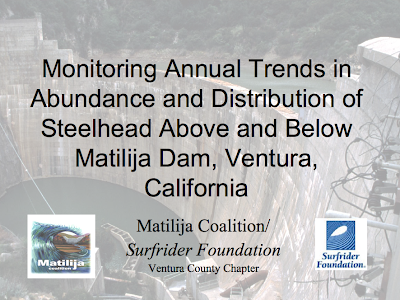 The Matilija Coalition would like to use a Fisheries Restoration Grant to support two years of comprehensive monitoring to compliment the studies that began in 2003 with habitat assessment for the Matilija Dam Ecosystem Restoration project. 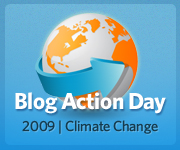 We have cobbled together DFG and Patagonia funding to support the program for the past 2 years. The objective of these studies is to establish baseline conditions prior to dam removal and contribute information on the variability of populations for the Steelhead Recovery Planning process. The key scientific question is the variation in annual populations in the drought-and-flood climate of Southern California, and the ultimate response of fish populations to a large-scale watershed restoration project such as dam removal. West Coast EBM Network 2nd Annual Meeting was held October 21‐23, 2009 in Port Orford, Oregon. The primary objectives of the meeting were to learn about the Port Orford project in depth and share ideas and opportunities on emerging issues. POORT aims to protect their historic fishing grounds through integrated management of a Community Stewardship Area. The knowledge of the local fishermen was used to identify the marine portion of the ecosystem that were most relevant to the management goals. 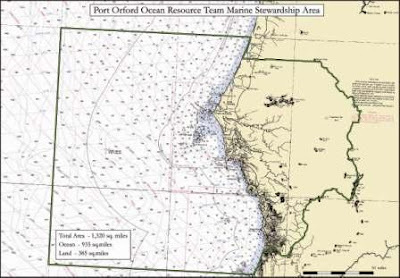 However, POORT also recognized the necessity to include the upland watershed terrestrial portions of their ecosystem that impact the marine portion and associated nearshore fisheries. As a result, their ecosystem planning area also includes roughly ¼ land area and ¾ ocean area. The specific boundaries of the Community Stewardship Area were based on input gathered at public meetings and workshops in Port Orford. The primary considerations were socioeconomic (e.g., historic fishing grounds) and political (e.g., north and south boundaries are halfway between adjacent ports). 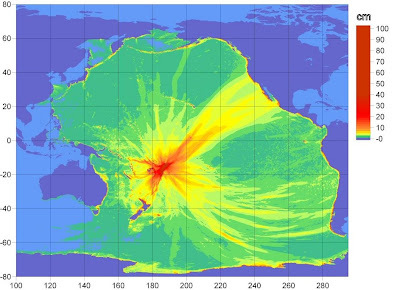 miles of terrestrial habitat and 935 square miles of ocean habitat. The area is 30 miles long (north to south), extends 18 miles offshore (west), and encompasses the Elk and Sixes River watersheds. The river received a much-needed rain this week. Ojai received over 4inches, and some locations in the mountains recorded almost 10 inches. Good news for farmers, whose wells ran dry sometime around July, forcing them to purchase water from Casitas Municipal Water District. 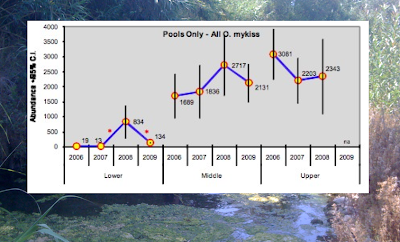 Good news for the river too, as flows were dropping rapidly at the upper end of the 'live reach' near Casitas Springs. and Oct 14, 2009 following the rain. 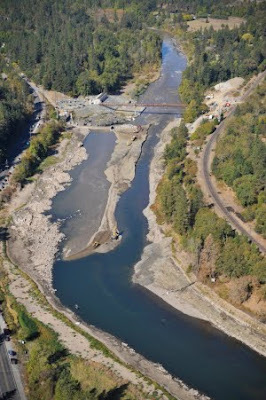 On Oct 9, another dam was removed in Oregon: the the Savage Rapids Dam on the Rogue River. Water Watch and others worked for more than 2 decades to remove this 39-foot high, 500-foot long irrigation diversion dam. According to Water Watch, the dam has long been considered the biggest fish killer on the Rogue. 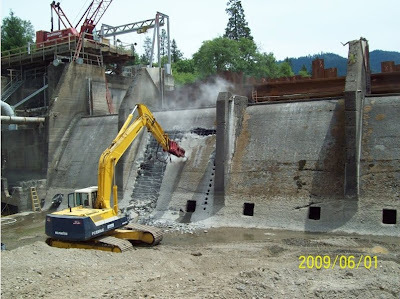 Dam removal was accomplished by constructing a coffer dam upstream to divert flows while the concrete dam was demolished. When the coffer dam was breached sediment was flushed naturally downstream. In this case, because of historic operations and limited storage the dam had trapped only 200,000 cubic yards . This volume is roughly equivalent to a 2-year sediment supply from the Rogue River. The reservoir sediments were found to consist of 71 percent sand, 27 percent gravel, and 2 percent silt and clay. 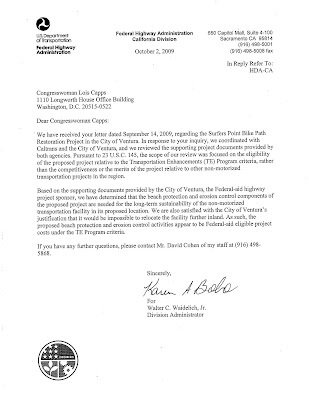 Cost estimate: $40 milion, with the funds primarily coming from federal government. Twenty-five years ago, Glenn Hening helped light a fire under surfers to get them to fight for the beaches and ocean they loved. As one of the founders of The Surfrider Foundation the world's largest surfing-based environmental organization, he helped create a generation of activists who were passionate about preserving the places they surfed and the ocean at large. "I want to give people a sense of where that passion came from and how the organization was put together and what we had to do for the first victory, said Hening, 58, of Oxnard. Those things came from the courage and determination one gains from being a surfer." 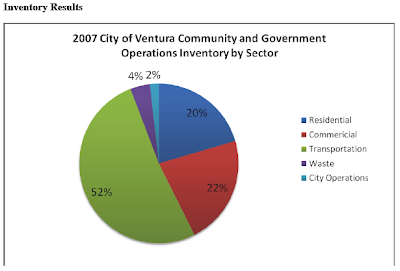 Paul Jenkin, environmental director of the Ventura County Surfrider chapter, which is hosting the event, said that kind of enthusiasm is needed. "It's that kind of passion that gets people going," he said. "It's a very apathetic culture today." Hening started the group with the idea of creating a way for surfers to respect each other and share their love of the sport. 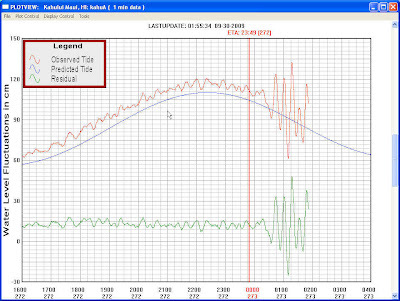 On Tuesday evening we had a small tsunami, or tidal wave, the result of an 8.0 earthquake in Samoa in the south Pacific. Although the effect seemed unnoticeable here, someone in the harbor may have detected a change in water elevation of about a foot, with a period of around 15 minutes. A time-lapse camera may have been able to record the event. Tide gauges around the pacific detected these 'tidal waves' as in this example from Hawaii. Because 'tidal waves' have such a long wavelength, they travel at high speed across the ocean - only 11 hours from Samoa to North America! From Wikipedia: A tsunami (津波) (pronounced /(t)suːˈnɑːmi/) is a series of water waves (called a tsunami wave train) that is caused by the displacement of a large volume of a body of water, such as an ocean. The original Japanese term literally translates as "harbor wave."